(October 19, 2015 – Toronto, ON) The imagineNATIVE Film + Media Arts Festival wrapped its 2015 run on Saturday night by presenting awards in 17 categories to Canadian and International Indigenous artists in film, video, radio and new media works at the TIFF Bell Lightbox. Hosted by Candy Palmater, the presenters included Alanis Obomsawin, Mrs Universe 2015 Ashley Callingbull-Burnham, Kent Monkman, and Chris Eyre. The imagineNATIVE Award Show provided over $40,000 in cash and in-kind prizes to these deserving winners as chosen by the imagineNATIVE Sun and Moon Juries. The American film, Mekko, took the Best Feature award. 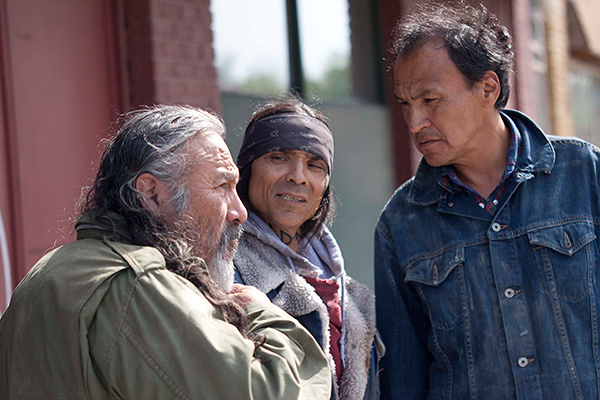 Mekko is the name of a Muscogee ex-con living on the streets of Tulsa becomes embroiled in a fateful conflict with a local thug, in director Sterlin Harjo’s intriguing fusion of gritty realism and Indigenous legend. It is Sterlin Harjo`s third feature, continuing the intimate portrayal of contemporary indigenous life begun in his previous films Four Sheets to the Wind and Barking Water, is a new entry in the canon of Indigenous New Wave cinema. Long-time Hollywood stunt performer Rod Rondeaux plays Mekko, a Muscogee man recently released from prison after serving nineteen years for murder. Shunned by his family, Mekko winds up in Tulsa’s homeless community, reuniting with an old friend, Bunnie (Wotko Long), and finding a new one in waitress Tafv (Sarah Podemski). But Mekko runs afoul of Bill (Zahn McClarnon), a terrifying thug who delivers a savage attack on Mekko and Bunnie while they sleep. Remembering a story his grandmother told him, Mekko becomes convinced that Bill is an estekini &emdah; a witch — and that, in order to bring light back into the community, he must destroy the darkness. The festival also awarded a special Honourable Mention this year for the short film Dancing the Space Inbetween to recognize the tragic death of director Lacy J. Morin-Desjarlais. She was a committed young artist who died last February in a car accident that also took the life of her collaborator on the film, Regina artist Michele Sereda. The tragedy also claimed the life of well-known Calgary theatre artist Michael Green and Blackfoot elder Narcisse Blood. Morin-Desjarlais was dedicated to her art, which bridged traditional culture and contemporary practice, as seen in this beautiful film, an elegy to the children who died attending the Regina Indian Industrial School. It had been previously announced that Tantoo Cardinal would be the recipient of the August Schellenberg Award. The award is presented by ACTRA Performers’ Rights Society & ACTRA National and generous individual donors – $1500 cash award.